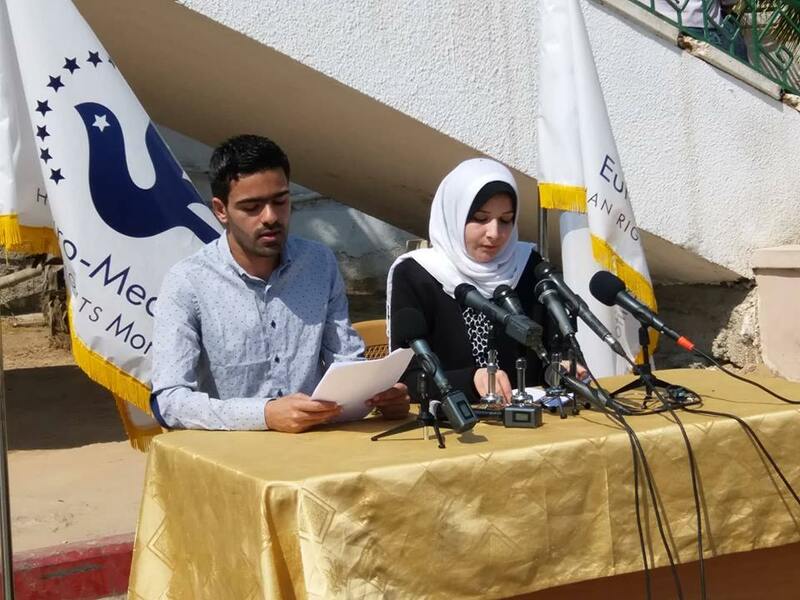 Gaza- A press conference was held today at the Al-Shifa Medical Compound by the Euro-Mediterranean Human Rights Monitor in which it issued a joint press statement signed by 45 different international organizations. This statement comes in light of the recent mass murder of Palestinians resulting from the Israeli army's use of excessive force to disperse unarmed demonstrators, killing dozens and wounding over 2,000. Since March 30, 2018, as weekly protests began at the Israel-Gaza separation fence, participants have been met with excessive use of lethal force by Israeli soldiers stationed at the fence, killing dozens of Palestinian protesters, most of whom posed no threat that could justify taking their very lives. On May 14, while Israel celebrated with the United States of America the opening of the American Embassy in Jerusalem, demonstrations peaked with tens of thousands of Palestinians marching towards the fence to commemorate the 70th anniversary of their Nakba and to demand their right of return. According to official statistics issued by the Palestinian Ministry of Health in Gaza, 59 Palestinians, including 7 children, were killed and some 2,771 others injured on May 14 alone as the Israeli forces used excessive force, including live ammunition to disperse unarmed protesters. The death toll has now amounted to 108, while injuries rose to 12,291, and still counting. 300 of the injured are suffering from serious or critical wounds. It is true that, in some cases, protesters threw stones at the Israeli soldiers, attempted to cross the fence, or used Molotov cocktails. However, compared to vast majority of cases, these were limited. Also, none of them used or carried firearms. Given the large numbers of casualties, Israel’s use of lethal force is in no way justifiable. It is arbitrary and excessive. It appears that there is a deliberate intention to further complicate injuries of protesters, causing serious injuries that may lead to permanent disabilities. In most of the injuries, according to doctors’ testimonies, explosive bullets expanded as they pierced the body, leaving an even larger exit wound. This has left patients with no choice except to have their lower limbs amputated. Soldiers seem to have been intent on causing amputations to protesters. The gas used to disperse demonstrators contained substances that caused tremor, fainting and hysteria. Doctors are concerned that it can lead to chronic lung infections, nervous system disorders or chronic spasms in the muscles and nerves. The Israeli leadership insists on supporting military operations on Gaza's separation fence, and refuse to investigate incidents there. The Israeli Defense Minister, Avigdor Lieberman said, during an interview with the Israeli Army’s radio station, on April 1st that, he would not be conducting any investigation in Israel’s actions on the borders. As for the Israeli Army’s Chief of Staff, General Gadi Eizenkot, he said “The orders are given for excessive use of force.” These statements and orders make Israeli Leaders directly responsible for these crimes. These demonstrations are taking place in protest of an unprecedented blockade by Israel lasting for over 11 years, in a form of collective punishment. Following three devastating Israeli military operations over the past few years, Gaza is expected to become unfit for life by 2020, according to UN reports. These demonstrations also come in light of a political deadlock for years now, a 50-year-long occupation, and a failure to put the right of return into action, all of which have further exacerbated the crisis. The international community must act now to end this conflict, primarily by lifting the Israeli blockade on Gaza and ultimately by ending the occupation. The Israeli Occupation is entitled to respect protesters’ right to demonstrate in a peaceful manner in the Gaza Strip, and the Israeli Leadership to prevent their soldiers from using force when dealing with peaceful demonstrators. Firearms shall not be used except in extreme, and unavoidable circumstances, as is stipulated in the pertinent International Laws. The Israeli Occupation must conduct an effective and serious investigation regarding the incidents whereby excessive force was used against the demonstrators in the Gaza Strip, and the use of weapons that have caused unjustifiable pain, while holding perpetrator accountable for these crimes, and bringing them to justice. The undersigned organizations also note the importance of referring these cases to the Courts of Justice of the countries party to the Geneva Conventions, under the principle of universal jurisdiction, to look into the said crimes. They also point to the jurisdiction of the International Crime Court, whose Public Prosecutor referred to the incidents on 8 April of this year. The Israeli Occupation must put an immediateS and unconditional end to the blockade on the Gaza Strip, and shall compensate all those who were affected by this blockade over the past years. The Israeli government must work seriously to end its long-term occupation of the Palestinian territories, allow the return of Palestinian refugees to their homes and compensate those who do not wish to return, as stipulated in UN General Assembly Resolution 194. Exert effective pressure on Israel to immediately end its blockade of the Gaza Strip, and end the ongoing Israeli occupation of the Palestinian territories, as it further fuels conflict and leads also to further escalation and violence in the region.